Taking short, rejuvenating breaks, allows our body and mind to recover and regain the ability to prioritize work and perform better. Research has proved that children who take breaks every 90 minutes during their study sessions tend to outperform kids who don’t’ take breaks at all. The activity practiced during breaks is as important as the activity scheduled for completion. So what are the healthy breaks that you can take? Read on. Change channels. In today’s computer-obsessed times, breaks don’t really make sense if you are still sitting in front of a computer, with the only difference being that you are playing games instead of working. Doing some sort of physical activity such as 10-minute walk, bodyweight exercises, or yoga will prove to be more useful. This is the best way to get maximum results out of a break. Ten to fifteen minutes of meditation will refresh the mind and relax the body. Juice it. During your break, try having a healthy juice option such as wheatgrass or green juice instead of black coffee. If you have time, run to a local food store or pack one from home. Enjoy your break by munching on some healthy snacks to keep your glucose and energy levels steady through the day. Healthy eats include whole grain crackers, fruits, and nuts. Power nap. If you are at home, close your eyes and drift off. A power nap is a great way to reenergize. Keep it to a maximum of 20 minutes. Motivate yourself if you are only left with the option of staring at your computer. Watch motivational videos on YouTube or read motivational quotes on other websites. Relaxation should not be confused with procrastination and laziness. Rather, it should be viewed in a more positive light, as a means to increase productivity. 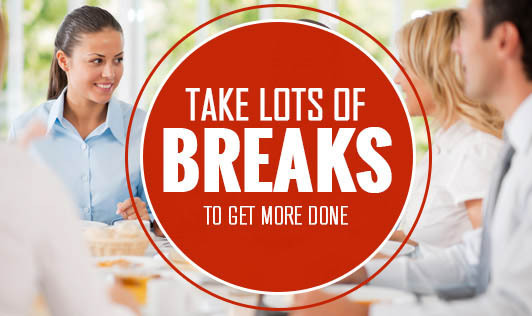 The next time you decide to take a break, try these healthy options!